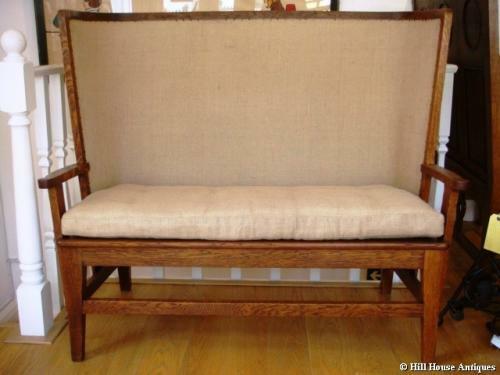 A rare Arts & Crafts oak framed “Orkney” settle c1900; possibly by Liberty & Co or retailed by them, now completely re-upholstered in hessian (with separate long cushion), to give it a modern yet rustic look. Arms terminating in scrolls and the whole raised on square section legs. Liberty & Co reworked and popularized the classic Orkney chair; an example was the “Stronza” armchair which was listed in their 1902 furniture catalogue; being an adaptation of a traditional Orkney chair with a high semi-circular back of woven rush. It was the most traditional piece of Orcadian furniture and was first made many hundreds of years ago when Orcadian farmers built them for their crofts. The original designs had shorter legs, allowing a user to sit much lower to the ground; thus avoiding the sooty air from the traditional Orkney home peat fires. The high backs allowed for both comfort and protection from drafts.